Chicago artist Chris Devins wants to give girls in the South Shore neighborhood a positive role model to look up to – literally. 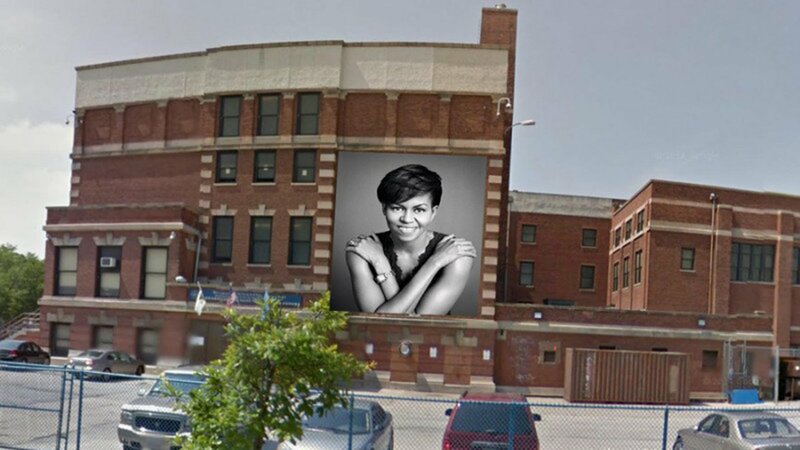 The renowned painter has announced plans to create a towering 20-by-22-foot mural of Michelle Obama on a wall outside Bouchet Elementary Math and Science Academy, where the first lady attended grade school in the 1970s. Devins calls himself an “urban planner artist” whose primary focus is on art that reaffirms or strengthens a community’s identity. Some of his other work includes murals of Nat King Cole, Louis Armstrong and hip-hop artists Common and Chance the Rapper. Obama is the third Chicago-born first lady. Betty Ford and Hillary Clinton were also born in the city. Born Michelle LaVaughn Robinson, the first lady attended Bouchet – then known as Bryn Mawr Elementary – from 1970 to 1977. She went on to attend Whitney Young Magnet High School on the Near West Side before earning her bachelor’s degree at Princeton and her juris doctor degree from Harvard Law School. Lavonte Stewart, associate district director for state Sen. Kwame Raoul (D-Chicago), originally came up with the idea for the mural and approached Devins about the project after seeing some of his other artwork around the city. Stewart called the first lady an inspiration to young women in South Shore and beyond, saying she wasn’t a “coattail-rider” who lucked into her career by marrying Barack Obama, but rather earned her success and served as the catalyst behind her husband’s presidential run. On top of highlighting the life and career of Obama, Stewart hopes the mural can shine a light on the South Shore neighborhood. The South Side community has, at one time or another, been home to the likes of Kanye West, playwright David Mamet and Hall of Fame NFL coach Marv Levy. But its population has declined sharply as Stewart says the neighborhood has been “under siege” in recent years from violence and disinvestment. He hopes the mural contributes to South Shore’s branding and its community identity. Devins has started a Gofundme campaign to help raise almost $5,000 for the project. He said planning and development will go on throughout the winter and he hopes to actually begin painting by next March. The cost of the mural is expected to fall between $14,000 and $15,000. Devins says he’ll match every dollar that’s donated and plans to cover the rest through donations from local community organizations and politicians. July 27: Jackson Park beat out Washington Park as the site for the future Obama Presidential Center. Reaction from Illinois delegates at the Democratic National Convention. April 20, 2015: Author Peter Slevin joins us to talk about his new book tracing Michelle Obama's family background, her upbringing and education, and her life with her husband. April 10, 2013: First Lady Michelle Obama makes an impassioned plea to Chicago business leaders to help solve the problem of youth violence here. Paris Schutz has the story.